Tom Maple pruning vines in early winter. Tina Maple and Jesse Contreras, early morning harvest. 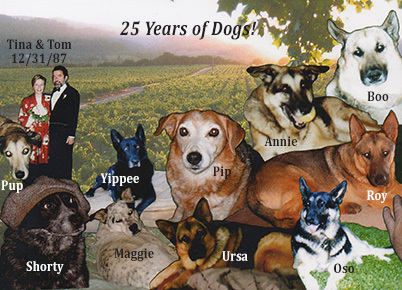 25 Years - and counting - of Dogs! Roy (far right) is our current "vine-side companion!" Tom Maple hails from the high plains of John Day, in eastern Oregon, where his father was a merchant and civic leader and his mothers family were ranchers. 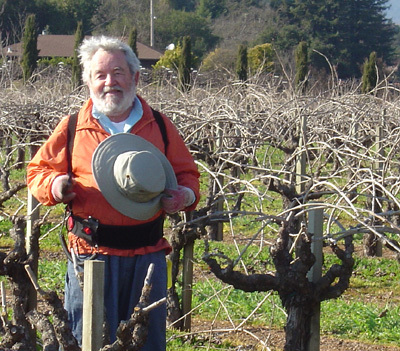 His life before farming can be described as adventure (years in Australia & Hawaii) and finance (which brought him to CA). Tina Maples midwestern roots grow back to southern Indiana and the suburbs of St. Louis, Missouri. From there it was art (school in San Francisco) and adventure (working and world traveling). 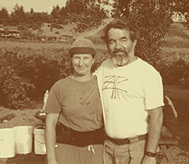 We got our start quite by accident when the house we bought in 1987 had a very small, very ancient vineyard attached. We became so smitten with grapegrowing that barely one year later, when the vineyard right in front of our deck came up for sale, we plunged. We had neither the money nor the expertise but lots of enthusiam  we sold our house, Tina went to school (viticulture and tractor classes), and we asked lots of local folks lots of questions. We both come from other lives but have found our home and hearts in Dry Creek Valley. We are blessed to be custodians of a vineyard that is the perfect combination of location, climate, grape type, growing style and growers personalities. For many years we have made our own "house Zin" at the end of each harvest - a few cases to enjoy throughout the year. In 2006, we decided it was time to get serious about our winemaking, so we took the plunge  again!  and harvested from Pip's, Oso's and Tina's blocks for the launch of our Maple Vineyards estate Zinfandel. Besides grapevines, Maple Vineyards specializes in adopting orphan and stray dogs. 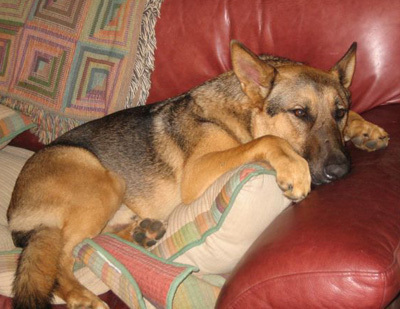 They perform hospitality, pest control and security duties on the ranch and are our best friends. 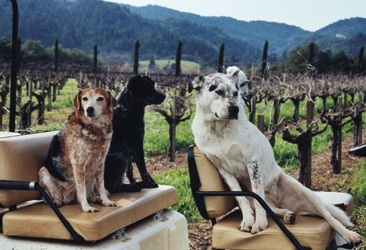 Most blocks in the vineyard are named for our canine pals, past and present. Current "Maple Hounds" include Shorty, Maggee and Roy. 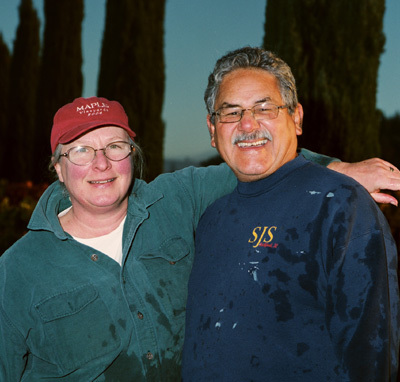 Winter days find them in the field with Tom as he hand prunes each vine or snoozing up at the house while Tina meets with vintners. Pip, Shorty and Maggee waiting for Tom to get in the driver's seat and take them for a ride! Our new boy, Roy -- from German Shepherd Rescue of Northern California www.gsrnc.org.